Another team effort – Pamela Wood. I’m really relieved that the in-the-works-forever project on environmental problems at Fort George G. Meade appears in The Sunday Capital today. It was a true team effort involving many people at the newspaper. It’s kind of a monster of a story that details the history and extent of contamination in and around the fort, as well as the fits and starts in the cleanup effort. City desk editors: Rob Hiaasen and Brian Henley did the word editing on the story. They also freed me up to spend about two-and-a-half weeks doing nothing but this story. And Rob is the one who gave me a kick in the pants by setting a deadline for this story, which had lingered in my brain for more than a year. Copy desk editors and designers: Shannon Miller and Greg Nucifora made a great map for the print edition of the story. Gerald Fischman copy-edited the story. David Marsters designed the print edition layout and uploaded the stories to our website. Mark Murphy, the boss of all those folks, got the space in the paper for the package. Photo desk: J. Henson pulled file photos and Paul W. Gillespie went out to Meade to shoot pictures of the main gate and signage, which can be a bit unnerving in these post-9/11 days. My project on Fort George G. Meade's environmental problems is finally done! As I mentioned, this story idea simmered for what seemed like ages. I had done some coverage of Fort Meade’s environmental problems, back when I was a west county reporter and occasionally as the environment reporter. In fact, the 2003 discovery of a landfill near Manor View Elementary School — my intro to this story — was one of my very first stories after arriving at The Capital. We’ve had some pretty good coverage at times of the Meade cleanup effort, including by my colleague Joshua Stewart when he was on the west county beat. He had some excellent stories when he was reporting on west county. But overall, it’s been hit-or-miss. We never quite explained the total significance of the environmental woes at Meade. Then about a year ago, Fort Meade held a public meeting about groundwater contamination in Odenton. Our west county reporter couldn’t go, so I went instead. 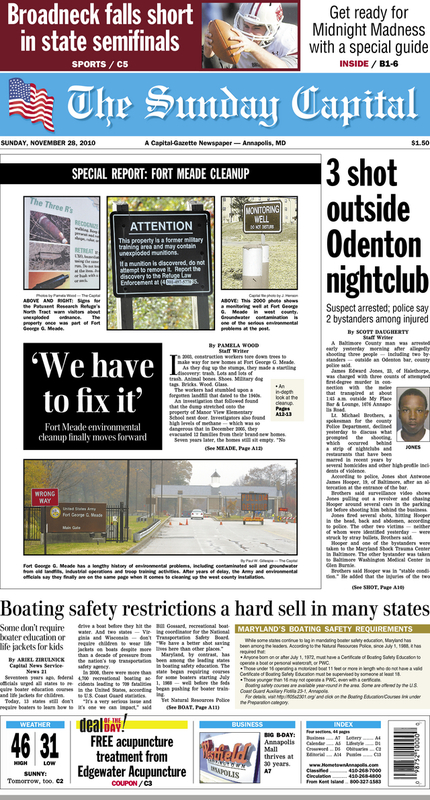 I did a “daily” story — a basic story for the next day’s paper — but it reignited my interest in Fort Meade’s environmental problems. I blathered on to my editor about all the things going on there, and he agreed that we should pursue more environmental stories at Fort Meade. I started attending the bi-monthly meetings of the post’s Restoration Advisory Board, and when I had extra time, I did some research. But the story didn’t really go anywhere. I always felt like I had more pressing stories to write, more immediate needs. Fast forward to this fall, and we had a shake-up of editors. The new boss encouraged me to do the story. So I worked on it a little more. Then he gave me a deadline. I stared at the instant message he sent me suggesting the deadline. I panicked. It was the day before Election Day. I didn’t want to be a chicken, though, so I agreed to the deadline. After the election, I asked permission to work solely on Fort Meade. I dove straight in and the result is what you see in today’s paper. I really hope the story gives a good picture of the problems over at Meade. I didn’t uncover any surprises or scandals. But I tried to piece everything together in a comprehensive way that no one has ever done before. Lastly, I’m really proud to work at a mid-size newspaper like The Capital. Smaller papers and niche websites often lack the manpower to pull off something like this. They can’t afford to have a reporter spend weeks on one story. And the big boys, well, they have bigger fish to fry than one Army post. TV and radio don’t have the airtime to go into this much detail. But for papers like mine, this kind of story hits a sweet spot. It’s not so big that we can’t handle it, and it’s small enough and local enough that it’s relevant to our readers. I hope they like it.